I had the pleasure of doing a couple of firsts last weekend. I got to play a full 300 point game against one of our newer Infinity players, Wyatt, and I got to bring out my Ikari! 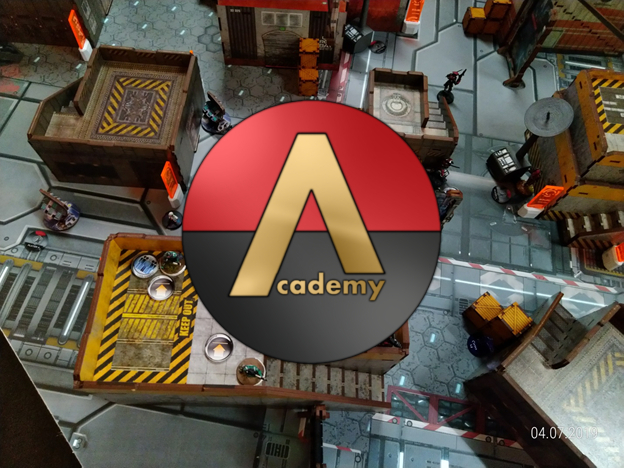 I have been playing ALEPH exclusively for the past 1.5 years and was going to continue to do so through June and the Rose City Raid tournament up in Oregon, but due to some scheduling conflicts I am unable to go. However, it just meant that I got to try out my mercenary army sooner than anticipated! We were playing Frostbyte for today and Wyatt won the roll off. He took turn while I took deployment and had him deploy first. Everything is listed in the picture for reference to save on time. The Suryat was his reserve and was the last thing to get dropped down. He was also running a “core” fireteam of 3x members: the Samaritan and 2x Rodoks which were in the middle-ish of this DZ. With regards to being my first game with Ikari, I just put a bunch of stuff on the table and hoped for the best. The Core Fireteam was on the rooftop on the right building with everyone prone except the Tanko ML and the Brawler MSV2 Sniper (proxied by Atalanta). While the Haris was to the left of the core team on the ground floor. My reserved was the KHD Ninja (big surprise, not) on the left side. With that we threw down our reserves (already placed in photos) and picked Datatrackers. Wyatt claimed his Suryat and I picked the Tanko Haris leader, and were underway! (I did spend a Command token to put up TeamPro with my EVO before Wyatt took his first turn). Wyatt added some supportware to his Q-Drone and started moving it up the board making short work of my Warcor. He got it past his rightmost (my leftmost) antenna and parked it behind some boxes there. I decided to reveal and do a change facing for my KHD Ninja since I wanted the order on my turn and figured “what’s the worst that could happen”? Well that’s when Wyatt wanted to kill my KHD, so he sent in Kerr-Nau to do some dirty work. A couple of short moves later he’s flipped his right antenna and is going for a Maestro attack on my KHD. Luckily it’s my first time ever using my sweet Ninja so of course things go poorly and I fall unconscious. (I didn’t actually expect things to go my way with my lower WIP and facing Maestro, but you always hope!). With my Ninja down, Wyatt’s Samaritan got hungry and wanted to get more wounds. I had his left side (my right) on lockdown with my core fireteam so he used his orders to get his monster across the board and eat my Ninja making himself scarier in the process. He then dropped the Samaritan into suppressive fire. I believe the Suryat also moved out a bit and went into suppressive before Wyatt passed turn. Impetuous phase of insanity!!! Group 2 had about 7x impetuous orders that were about to happen and I had no idea where to start, so I went with all 3x bikers first. The desperado in the middle moved up and crit won his FtF smoke throw against the Q-Drone who was still rocking supportware (super lucky there). Yojimbo ended up having to go the same direction since the Q-Drone was the closest enemy model. The Desperado on the left came around the corner and tried his heavy pistols against the Samaritan and actually got a wound off! Before more celebrating it was time for space pirates! 4x Yuan Yuans dropped in all over Wyatt’s DZ with only 1x suffering dispersion off the table edge, which just ended up with him on my board edge near the Samaritan and Desperado who were in their epic shoot out. 1x Yuan landed behind the left Ikadron, while another landed in the middle next to a heater and the fourth one landed on the right side near the Nexus hacker. The Fat Yuan next to the Ikadron attempted to melee with his DA and CC of 19, I rolled a 5 and got electric pulsed (dang). The middle Yuan I waffled a bit on either attacking the heater or going for hitting a bunch of enemies. I went with the ladder and managed to chain rifle: baby wurm, 2x Rodoks, and an Imetron. I knocked out the shotgun Rodok and Imetron while the others passed saves and blasted my space pirate to unconscious (yay). Yuan Yuan in the middle chain rifling everything he could! The third Yuan managed to pop out and (he rolled for a combi with his booty roll) shot at the Nexus hacker Lt and ended up knocking him unconscious! My desperado and last Yuan Yuan both attempted to take out the Samaritan with their irregular orders, they got him to NWI but couldn’t finish him off. Luckily with my Impetuous and irregular orders causing so much chaos, and the smoke blocking the Q-Drone (thank you desperado), my group 1 had 9 orders to go nuts with! My last 2x Irregular orders were my living Desperado and YoJimbo throwing smoke over the middle antenna to keep my approach safe. My Haris team moved up and were able to flip the middle and rightmost antenna both on the first WIP rolls (yeah who needs WIP 15 ALEPH). All the smoke I could need! I had my Flammenspeer Tanko move up to take out several targets, the Imetron in the open and then use his Flammenspeer to knock out the M-Drone and Unidron. It took a couple of Contender shots since his units were making ARM saves, but eventually everyone was cleared away. No more Unidron or M-Drone, silly Yuan Yuan is all IMM though. I shuffled around my Haris a bit trying to keep my Datatracker and Doctor safe while Flammenspeer just kinda stood out in the open in a very “come at me bro” stance. With that I passed turn to Wyatt. Wyatt’s in LoL and a lot of his orders got eaten up on my first turn, but he’s got a few tricks up his sleeve. He throws down a White Noise with Kerr-Nau to have his Q-Drone move out and get a beat on my MSV2 Sniper. I’m on -9 with White Noise and cover, but get super lucky on my FtF rolls and the Q-drone goes down (Ah that’s not good for Wyatt). The Suryat then goes and wrecks the Yuan Yuan that took out the Lt. Then the Suryat walks up a building overlooking the board and goes into suppressive fire. Wyatt then flips a few orders and has his Rodok ML try and shoot my Doc Brawler who is not entirely hidden but he keeps getting unlucky and missing entirely. Dr. Wurm uses baby wurm to pick up the shotgun Rodok with its irregular which is good for Wyatt. The Ikdadron re-zaps my Yuan Yuan in CC with it, and I think a couple of units shuffle around or their orders got flipped. Oh the Samaritan eats the Desperado infront of him and goes back to 1 Wound up from NWI. Wyatt then braces for the storm and passed turn. Impetuous Phase! Well my Yuan Yuan is stuck, so my Desperado goes and gets suppressive fired by the Suryat, while YoJimbo moves but isn’t seen and he throws down some smoke. I do some quick LoF checking and it appears if my Brawler Sniper moves to the other edge of the building I can get a shot off on the Suryat. I make the movements and blast the Datatracker off the table with my Multi-Sniper. I want to make a quick note that Wyatt actually wanted to “call it” here as he felt things weren’t going to get better. I encouraged him to play it out and see what could be done. Little did I know I would eat my words, but more importantly I’m glad we took the time to play it out, it was a learning experience for us both. Welp, I’ve still got a ton of orders in group 1, what’s the worst that could happen? Right? I move up the Haris with Flammenspeer Tanko in front, edging towards the ML Rodok to take him out. Wyatt smartly ignores the front Tanko and ML blasts the Doc which also hits my Datatracker since he moved into range of the blast. The Doc and Tanko/Datatracker fail all their ARM saves and are toast. Meanwhile the remaining Tanko misses his Contender shot since I was out of range I forgot Rodok’s have Mimtism, so I was on 7’s, bleh. Wyatt just picked up 2 points and denied me 3, so I figure I’ll send my Tanko on a rampage, and rampage he does! He takes out the Rodok ML. He then moves up and splits burst with his pistol on the Ikadron and Dr. Wurm. Ikadron drops and Wurm passes ARM, I attempt again at full burst 2 and knock out the Doc. I then round the corner and base the shotgun Rodok who was brought back up. He gets Monofilament crit off the table. Crazed Tanko goes on a murder-spree! Normally I wouldn’t break up a fireteam like that, but the Samaritan had free reign to cross the board and eat for free making him scarier. I had to throw units at him to keep him there since he could have been a huge problem for my backline. I’m blown away by your tactics considering you’ve only been playing for a month?! I dunno what kind of training program you’re running but keep it up! Thanks for sticking it out even though things were looking dire, you never know what will happen till you see it through! Well by not sending in the Tanko alone and breaking up the fireteam you went from a 9-2 Major victory to a 6-4 minor victory. Got murder-tunnel vision and wanted the extra burst, but this was a merc faction so it seemed more thematic then tactical. OOF, been awhile since I’ve played anything that different, I wasn’t used to soooo many models on the board let alone all the new profiles. Gonna have to trim the list down just a bit till I can get a better handle on Ikari. Yuan Yuan are awesome?! I mean what’s not to love for 8-9 points? They are the reason I even wanted to play Ikari and with ITS season 10 making AD even easier to land, no time like the present. Ikari was a ton of fun overall. I’m used to playing a more tight/conservative game with ALEPH. Ikari however was a mash of bodies shooting and causing chaos, who cared if my units died? There were plenty more around the corner.